I love using my crock pot. For our wedding, we got a fancy digital crock pot that automatically goes into the warming phase after the designated time. It's awesome. Throw a bunch of stuff in when I'm getting ready for work, come home to a hot dinner. It's like having an on-staff chef that I don't have to pay. 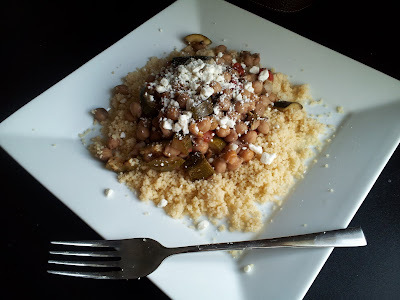 I had a bag of chickpeas to use up, so I whipped up this meal, which fed us for days and days. Place the drained chickpeas in the crock pot with the onion and half of the oregano. Top with four cups of water and cook on low for five hours. When I got home, I threw in the zucchini, tomatoes and broth and cooked on high for two hours. I then added the rest of the oregano and some salt and pepper. Serve this over the couscous and top with cheese. This made at least 10 servings and was super cheap. Sounds so, so good. Couscous is a great idea. I cook beans a lot, but am still resistant to pressure and slow cookers. This must change!